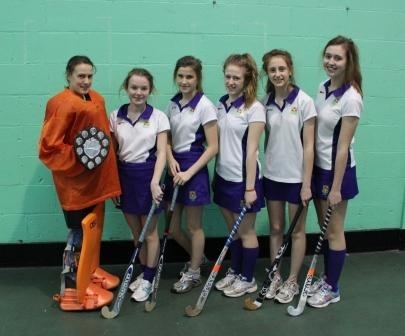 On Monday 9th December, the Blackburn with Darwen U16 Indoor Hockey Tournament was held at Westholme. Six teams from the area participated – there were teams from Darwen Vale, DACA, St. Bede’s, St. Wilfrid’s and two from Westholme. The teams played in two groups with the winner of each group going through to the final. The six-a-side eight minute games were played at high speed on the indoor surface, and great control and skill were required to keep possession of the ball. As they didn’t lose a match, our ‘A’ team made it through to the final where they faced the winners of the other group, St. Bede’s. After eight minutes the result was drawn at 0-0 so the decision was made that we would continue to play for a golden goal – with the first team to score winning outright. Battle commenced again, with Westholme eventually winning supreme with a shot made outside the ‘D’ but that hit a defenders foot on the way in. Not particularly conventional, but a win all the same!